Style meets function in Vamp LED Lighting. 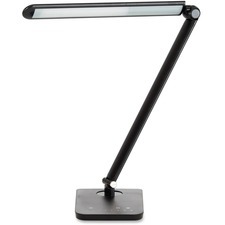 This ingenious, flicker-free, energy-saving, practical light features a multi-pivot flexible neck, creating just the right light for every work project. Touch-free dimmer switch with memory button will recall your last setting. Eight brightness settings are available with the swipe of a finger. The eight color settings include four warm and four cool. Reduced glare filter makes viewing electronics easier and may help to lessen eyestrain. Going one step further, the lamp also offers a USB port in the back of the base to recharge digital devices. The 550 lumen lamp is made of ABS plastic and aluminum. It is free of lead, mercury and UV rays with zero pollution.